These just make me smile!! I’ve seen several versions of these recently on blogs and in stores and I had to try them- talk about quick and easy! I have no idea who originally came up with this – but kudos in the creativity department!!! Love ’em! 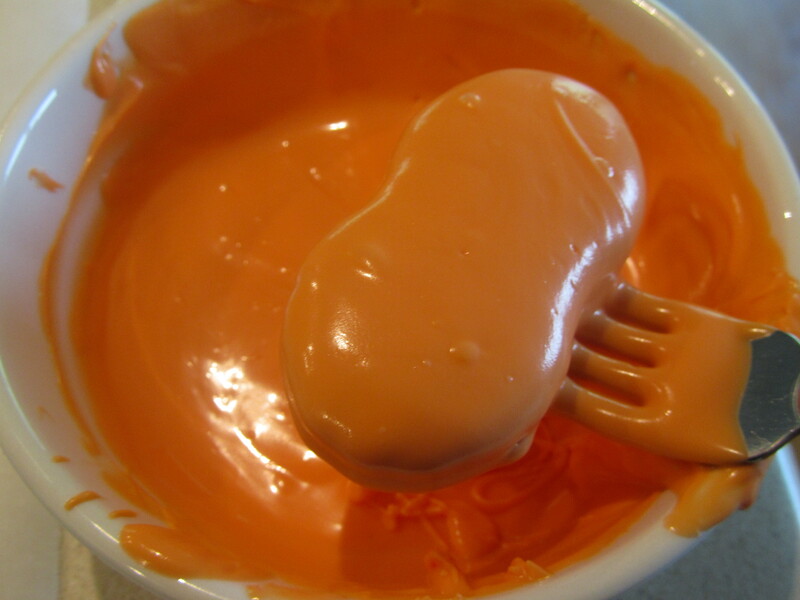 Melt 7oz. (1/2 a bag) of each color of candy in 4 separate bowls in the microwave in 30 second increments, stirring in between. 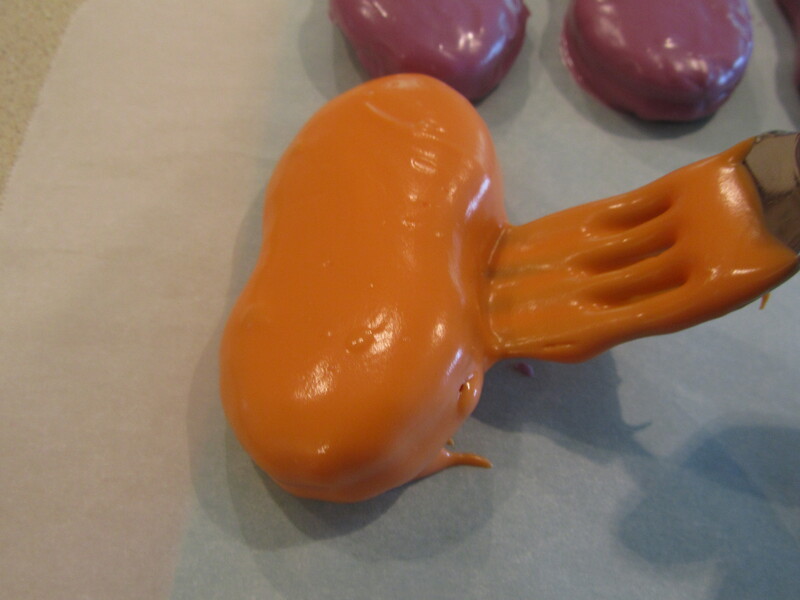 Dip one cookie at a time in the candy melts, covering it completely and then lifting it with a fork and tapping excess melted chocolate off. Set on parchment paper to harden. Spoon remainder of each color into small ziplock bags and clip a corner. 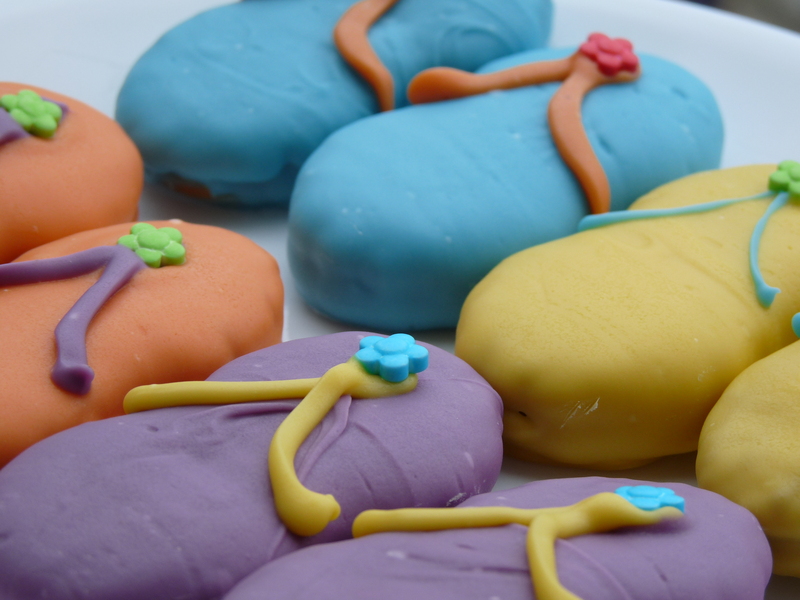 Using a contrasting color, carefully pipe a flip flop “strap” on each cookie. Add a candy flower or other candy decoration to strap before it hardens. Posted in Cookies, Easy recipes and tagged chocolate, cookies, desserts, flip flop cookies, kids dessert, Nutter Butter, peanut butter, summer cookies. Bookmark the permalink. I would have to SHUT UP at these! These are the cutess thing I have seen! Cookie and flip flops com eon does it get any better then that?? These are adorable, and such a great idea! Love them! Thank you!!!! Hope you get to try them this summer! Thank you for linking up to Bacon Time. For the first party it was a huge success with over 300 links. I am going to have a special give away next week just for linkers. Thanks for grabbing the button too! 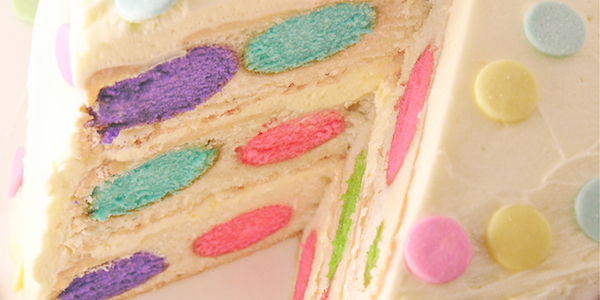 I love this recipe, so cute, and nutter butters are one of my favorite sandwhich cookes. Very clever. These are so cute!! What a terrific idea for a summer party! My favorite I’ve seen so far! 😉 They look awesome! Would love to have you link up with us on Sunday with this post for a Strut Your Stuff Sunday party! Thank you! I will try to link up! Just wanted to let you know that I will be featuring you on Friday morning in my feature post for the linky party. Check it out and grab a featured button if you like. Love these and would like to share on my site! I also made them without the candy melts and just piped the frosting and little flower. Still look adorable! 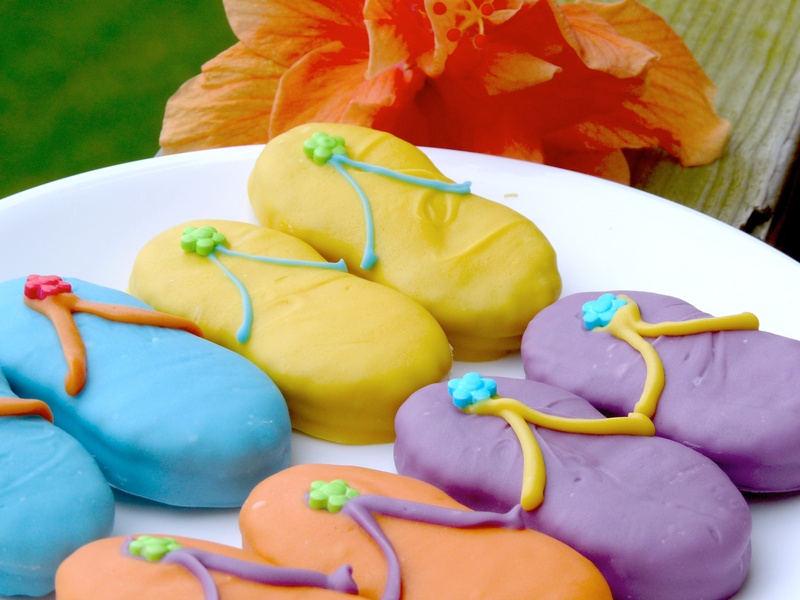 They make a perfect luau or pool party favor! I gave these a try this weekend for my daughter’s graduation party ~ in honor of their “beach week” after graduation … I didn’t have very good luck with the chocolate ~ it seemed too thick … it didn’t “run” off the cookies after dipping so I had to scrape some off each time with a spoon…they came out very cute in the end, but were not quick and easy as yours were, apparently!! Everyone at the party loved them and I’m getting really sweet comments on FB! Thanks so much for sharing such a cute idea! now those are just cute! These are so cute and perfect for Hawaii, where everyone wears flip flops all the time (well, actually they call them slippers, not flip flops). I’m going to have to make these for our next party! Hi! Thank you for the inspiration! I found you via Pinterest. I have linked your post to my blog. You’re welcome– and thanks for sharing a link on your blog! Glad to connect with you!